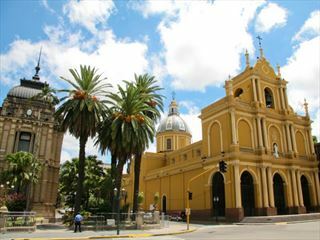 Arrive into Buenos Aires and transfer to your hotel. 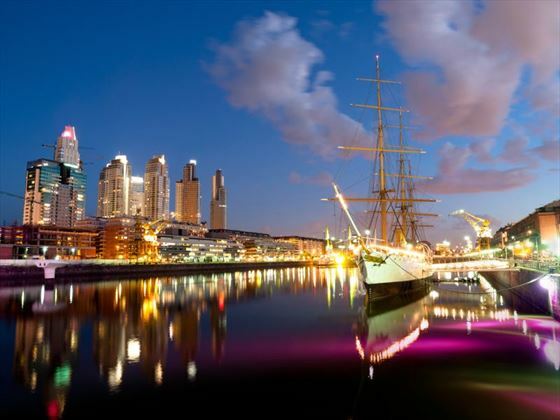 Buenos Aires is a bustling and vibrant city that’s full of life – there will be free time today to explore the many attractions. Why not check out a football match, a tango show or experience the famous nightlife in the evening? Be sure to head to one of the cafés and restaurants to sample to local cuisine, such as succulent bifé and parrilladas. 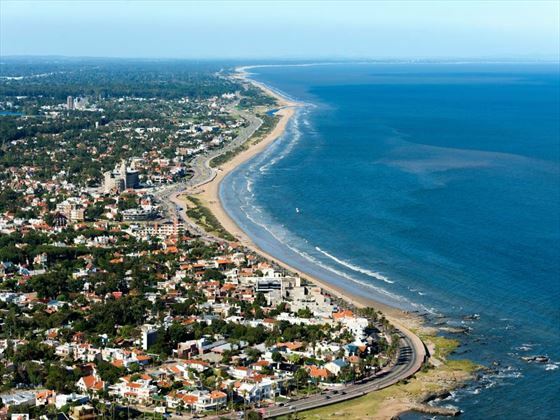 Cross the Rio de la Plata by ferry to arrive in Colonia, Uruguay. There will be some free time to explore the culture and be amazed by the stunning architecture as you stroll down the cobblestoned streets. In Montevideo, the country’s capital, you can visit the Carnival Museum and grab a snack at the Port Market. 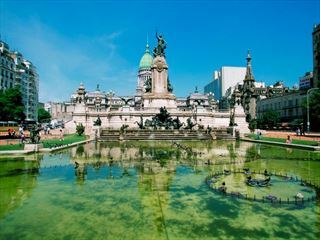 Montevideo is a quiet yet modern city, with a fun and friendly ambience. There are some great museums here, as well as a selection of picturesque beaches just outside the city. Leave the city today in search of real Uruguayan life, passing through settlements and pastures before reaching a local ranch, known in the region as an estancia. You’ll spend the day getting into rural life, learning about the historical roots of the region and taking part in the farming, hiking in the countryside and indulging in the local food and wine. You’ll have time to go horseback riding or sip on the local wines as you admire the views. In the afternoon on day eight, you’ll be crossing the border on a long overnight journey to Iguassu Falls. The next couple of days will be spent in awe of the majestic Iguassu Falls, which borders Brazil, Paraguay and Argentina. 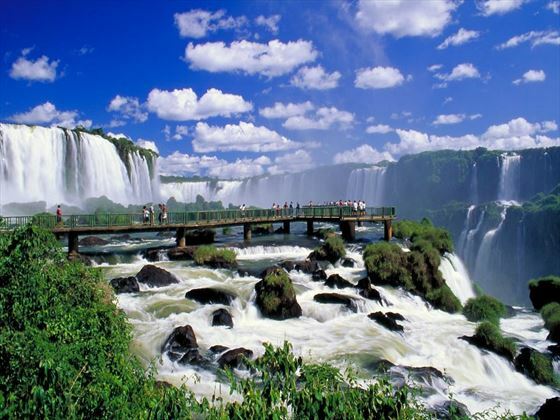 But in order to see the falls properly, you need to see them from both the Brazilian and Argentinian side. Begin from the Brazilian perspective, which offers a grand overview of the falls with some truly spectacular panoramic views of one of the world’s largest waterfalls. 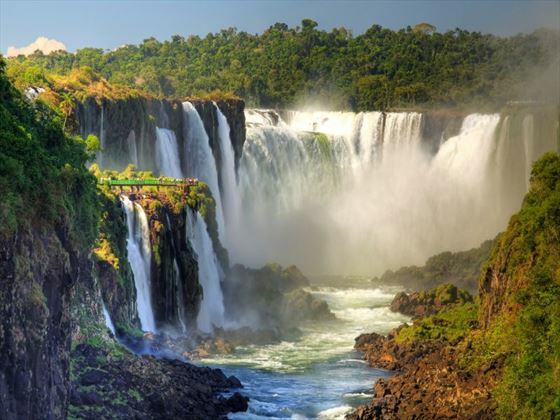 On the Argentinian side you have the option to experience the falls from a completely new angle – a boat tour taking you right up close to them! Be prepared to get wet but it is completely worth it. This UNESCO World Heritage Site is a real highlight of this area. 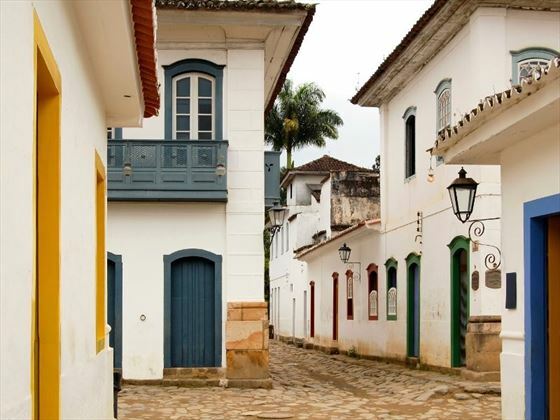 Fly to Sao Paulo today and head straight for Paraty, a charming, quaint colonial town with stunning architecture. There’s a slow pace to this area but still plenty to do, including visits to an old plantation and sampling artisan cachaça – the main ingredient of the country’s national cocktail (Caipirinha). Alternatively, make the most of this coastal town and take a boat ride to one of the secluded beaches just outside of the city for a luxurious swim, snorkel or dive for an unforgettable underwater experience. If you’re lucky you may spot dolphins, sea turtles and nurse sharks. On day 13, travel to the port in Angra dos Reis and take a boat over to Ilha Grand which is located just off the coast. Relax with a refreshing Caipirinha as you enjoy the gorgeous views from one of the island’s many beaches. If you want something more active, why not go snorkelling or surfing at Lopes Mendes. There’s a true tropical paradise feel to this place, with very few cars and amazing scenery. 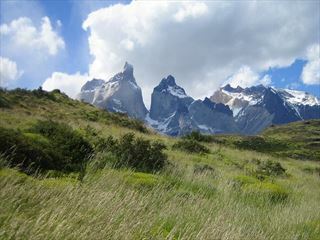 There’s also time for hiking, swimming or biking if you prefer. Pass striking scenery as you round the cliffs at Vidigal, offering you your first glimpse of the beaches of Rio de Janeiro. If there’s any free time, spend it taking a city tour or exploring the many delights from the centrally-located hostel in Copacabana. This sprawling metropolis is a fascinating and inviting city with so much going on all the time. 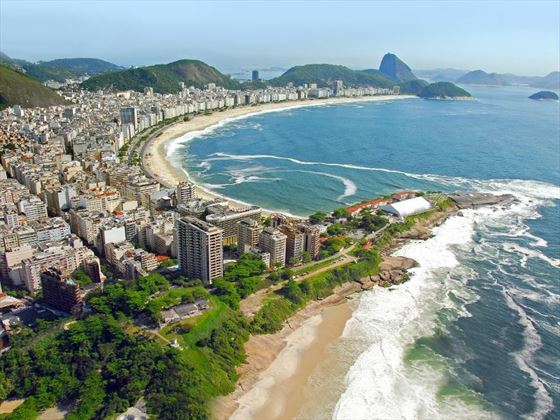 The beaches and ocean are in the south of the city, as are most of Rio’s richest neighbourhoods. Depart from Rio de Janeiro today. This tour is specifically for people aged 18-35 only. If you are older then please ask us for similar tours that can accommodate you.